AIWA-SF and Executive Board members will facilitate the discussion. Dr. Kohar Der Simonian, M.D. serves as Assistant Clinical Professor in both the departments of Family and Community and Obstetrics and Gynecology at UCSF. She is the Reproductive Health Faculty Lead for the Family Medicine Residency program, and serves as Director of the TEACH Program, which provides curriculum development, professional advocacy, and training support in reproductive health for family medicine residents. Dr. Hasmik Arzumanyan, M.D. 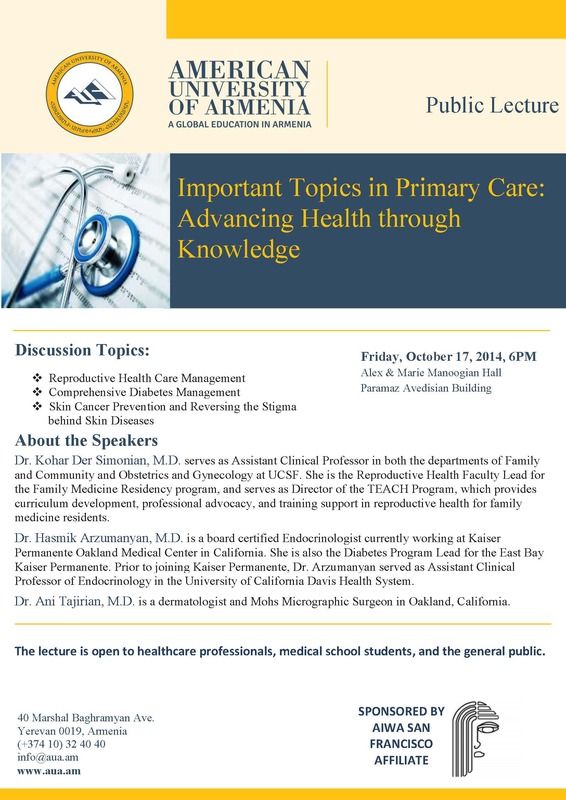 is a board certified Endocrinologist currently working at Kaiser Permanente Oakland Medical Center in California. She is also the Diabetes Program Lead for the East Bay Kaiser Permanente. Prior to joining Kaiser Permanente, Dr. Arzumanyan served as Assistant Clinical Professor of Endocrinology in the University of California Davis Health System. Dr. Ani Tajirian, M.D. is a dermatologist and Mohs Micrographic Surgeon in Oakland, California.